The Shimano’s line of fly reels is specifically designed for trout fishing. The Shimano Biocraft XT 5/6 Large Arbour Fly Reel is created through the process of cold forging technology. This technology produces strong yet light weight frame and spool that results to a reel that’s both aesthetically and technically impressing. Featuring advanced technology, the reel is incorporated with a single disc micro adjustable drag for smooth performance. Plus, the reel has a quick change push button spool and an easy handle conversion so you won’t have a difficult time trout fishing. Okuma prides itself on shattering price barriers in an effort to deliver high-quality tackle to anglers of all financial means. 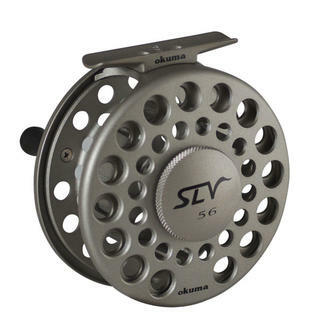 SLV series fly reels are the latest example. With super large arbor spool design for blazing fast line retrieval, SLV reels keep pace with the fastest species in water. Die cast aluminum frame, precision machined stainless steel spool shaft, one-way roller bearing and multi-disc cork and stainless steel drag system read like the specifications of reels costing two- to three-times as much. With a total commitment to advancing the quality of your fishing experience, the SLV selection begins with a 2/3 model and continues through 10/11. Easily affordable spare spools allow you to outfit your efforts with a selection of line types. Get yourself into fly fishing with the NZL Aluminium 6/8 WGT Fly Reel Spooled with WF8F 20lb Backing. This large arbour aluminium fly reel features 3 ball bearings with 1 infinite anti reverse bearing. It also features a disk drag for a smoother fish fighting performance. Plus it's easily interchangeable from left to right hand wind, so it doesn't matter if you're right or left handed. To complete, it comes pre-spooled with 75yds 20lb backing + WF8F line.